Until recently, the price of crude oil and food moved largely in tandem. Since 2005 the correlation coefficient between the two price series (sourced from the IMF) has been +0.84. 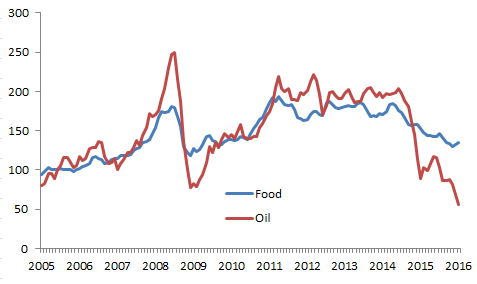 However, since late 2014 food prices have significantly outperformed crude oil prices. Note: The IMF food price index includes cereal, vegetable oils, meat, seafood, sugar, bananas and oranges while their crude oil price index is an average of Brent, WTI and Dubai. Energy is a vital component of a farm’s operating costs. Direct energy consumption includes the use of diesel, electricity, propane, natural gas and renewable fuels for activities on the farm. Indirect energy consumption includes the use of fuel and feedstock (especially natural gas) in the manufacturing of agricultural chemicals, such as fertilisers and pesticides. Energy makes up a significant part of operating costs for most crops. This is especially true when considering indirect energy expenditure on fertiliser because the production of fertiliser is extremely energy intensive, requiring large amounts of natural gas. For some crops – like oats, corn, wheat and barley – the combined cost of energy and fertiliser make up more than half of the total operating expenses in the US. The proportion of direct to indirect energy use varies by crop though. Corn, for example, is an energy input for ethanol production; it has relatively low direct fuel costs but has the highest percentage of fertiliser costs. Meanwhile, with certain agricultural commodities now seen as substitutes to oil, as they are being diverted into biofuel production this allows the transmission of higher oil prices and volatility to affect agricultural prices directly. The chart above might imply that food prices have further to fall, by as much as 60% if the trend since 2005 is to be believed. However, could something more fundamental be happening? With oil prices back to 2003 levels we need to take a much longer term perspective. And it appears that perhaps oil and energy prices are just not as important in driving food prices as they once were. 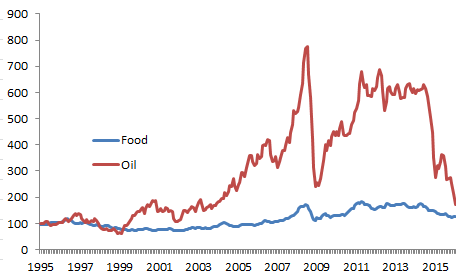 Between 1995 and 2004 the correlation between oil and food prices was -0.13. Looking at the chart below shows how energy prices diverged from food prices, starting in 1999, and then only in the past couple years coming back into line following the drop in the oil price. This week the World Health Organisation (WHO) labelled bacon, salami and sausages as “Group 1” carcinogens, in the same category as cigarettes and asbestos. The WHO’s new labels appears to cast hamburgers as even more dangerous than was previously thought. 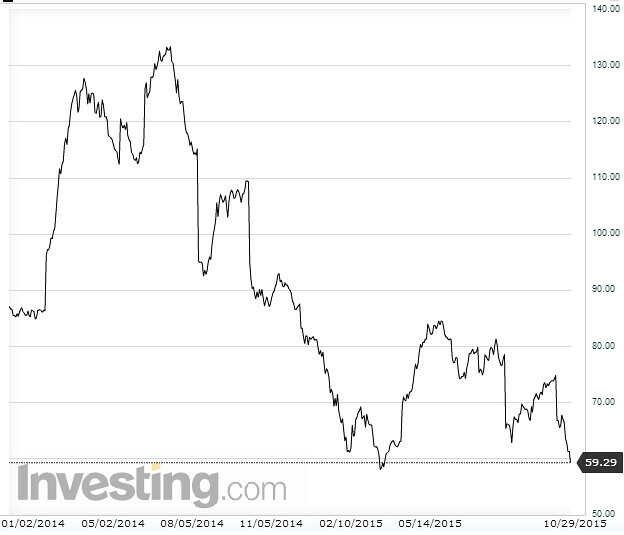 Despite the scary looking chart below the impact on hog futures has been quite muted. The WHO announcement could only have been responsible for that very last leg down, on the far right hand side of the chart, and this only brings hog future prices back to February 2015 levels. As the Economist say in their latest edition this reaction is probably correct. However there is no reason to panic. The concern over bacon, steak and cancer is not new. In 2007, for example, the World Cancer Research Fund published a tome on the sources of risk for cancer—the group advised eating no more than 300g of red meat each week and avoiding processed meats, such as bacon and ham. The WHO’s 22 experts did not produce fresh data. They simply reviewed existing research. Their most notable contribution is to conclude that there is “sufficient evidence” that “eating processed meat causes colorectal cancer”. That does not equate bacon with cigarettes. Processed meats are responsible for 34,000 cancer deaths each year, according to the most recent estimates. Smoking accounts for 1m; air pollution 200,000.